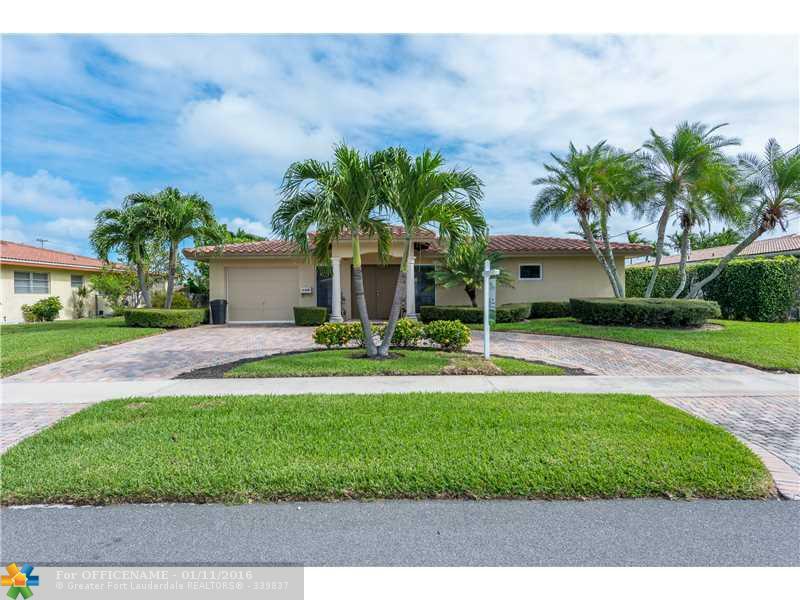 This lovely Garden Isles home for sale is located in Pompano Beach, Florida. This home has been completely remodeled from the studs up! The electrical panel and air conditioning have been recently changed out. The windows and doors are high impact. The foyer entrance to the home has just been redone. The home boasts marble floors throughout. The chef's dream kitchen has new cherry wood custom cabinets, a full suite of stainless steel appliances, and sleek thick granite counter tops. The backyard oasis features a remodeled pool with pavers. the newer dock and two fixed bridges to ocean access is perfect for the avid boater. There is one hundred and twenty feet of wide canal waterfront. The mature lush tropical landscaping is meticulous. The split bedroom floor plan is perfect for guests. The bathrooms have been made over in marble and the master bath has a Jacuzzi tub. This home has an open floor plan that provides a bright airy feel.This is a turnkey home with all furniture and televisions included. Residents of Garden Isles are in close proximity to fine shopping, dining and entertainment at nearby Mizner Park and Boca Town Center.